With over 80 miles of groomed trails winding through 75,000 acres of wilderness, Mammoth Lakes is perfect place for your snowmobiling vacation. Enjoy the most scenic snow trails the High Sierra has to offer! Guided tours and specialty rentals all at affordable prices! Supplier, rental outlet and repair shop for power sport supplies, including ATVs, snowmobiles, dirt bikes and more. Only 1/4 mile from 300 miles of trails. Mammoth boasts over 80 miles of groomed trails located on 75,000 acres of forestland. Many great trails leave from the Smoky Bear Flat staging area just north of Mammoth Lakes. For equipment rentals and great custom tours, contact one of the providers located on this page. If you’re looking for a fast paced, high-speed thrill ride through beautiful backcountry trails, snowmobiling is your sport. Mammoth Lakes boasts over 80 miles of groomed trails winding through 75,000 acres of wilderness. 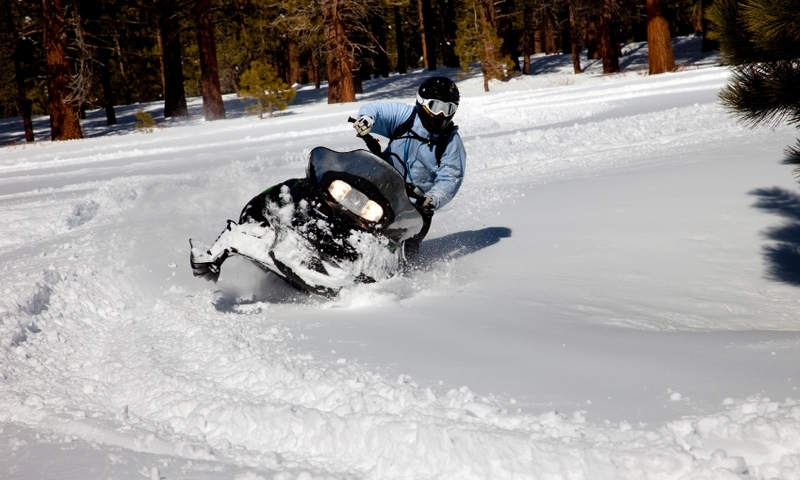 The snowmobiling trails around mammoth vary in length and difficulty level. Most leave from the Smokey Bear Flat staging area, located just north of town off US-395. We’ve compiled a list of the more popular routes. If you’re new to the sport this trail is a great place to get comfortable riding. At 11 miles in length, the trail takes just about an hour to complete. Find the trail by looking for the blue markers. This twelve mile trail takes about 2-3 hours and takes riders on a tour around the base of the peak. The trail is marked by orange lettering. This 24 mile trail travels from the mountains base at 9,104 feet and winds its way up to the top of the mountain. Expect 3-4 hours of riding. This long ride is for advanced riders only. Rentals are available from several area providers. If you’re looking for gear, lessons, or advice, take some time to explore the suppliers, outfitters, and shops located on the page. They provide expert advice and invaluable local's only knowledge.